The design and management of Murrnong Farm has been guided by Permaculture Ethics and Design Principles. The intention is to live and farm within the limits of nature, and to operate mainly from current sunlight. While the farm does presently use some non-renewable resources such as fossil fuel to power relatively minimal use of the small tractor and petrol powered irrigation/ fire pump, with a few changes the farm could continue to operate very well without this input. The biggest tractor use is for mowing grass between trees where it is difficult to manage grazing without causing damage to the tree crops. This tractor use could be avoided with more human labour to closely manage grazing. The additional grazing livestock would increase and diversify production, and improve fertility cycling. 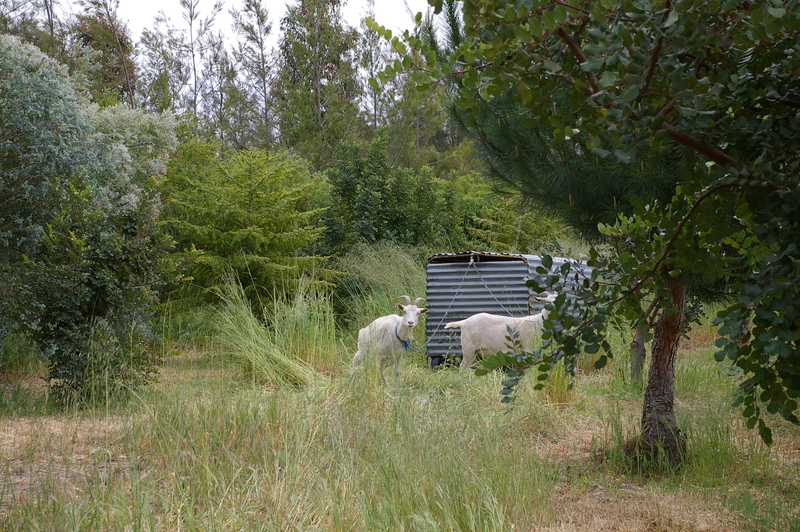 Spring 2007, goats grazing on move-able tether between carob, bunya and stone pine. Some crushed rock dust fertilisers were brought in initially, (and may not even have been necessary) but these days no fertility inputs are deliberately brought in, other than small quantities of bought food, with wastes composted on-site. The flood plain wetland does harvest some flood-borne nutrients. By far the greatest fertility factor is the management of plant growth, and the consequent feeding of soil microbial processes by plant roots. Fertility development and cycling is complex and seasonal, but on this farm is now mostly self-regenerating. Perennial tree crops are an important part of this. Most of the food and all of the fuel wood for farm residents is produced on the farm. In the early years some compost teas were used to help get soil microbial life going. When possible, we let plants grow to help improve the soil with their roots, and this includes some plants that are conventionally described as weeds. Then, when we need to focus available water and nutrients on productive trees, for example, we mow grass and cut back other perennial plants. 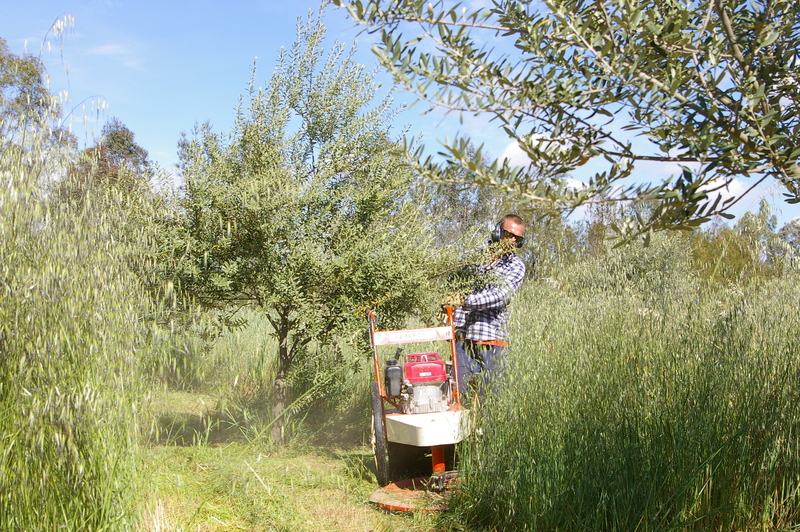 October 2008, Matthew Lewis operating walk behind slasher to mow under young olive trees. At the very local level, trees and perennial plants are good at cycling nutrients and improving soil fertility around themselves. At the farm scale, produce is harvested, consumed on-site or increasingly sold off-site, and nutrients do move around. 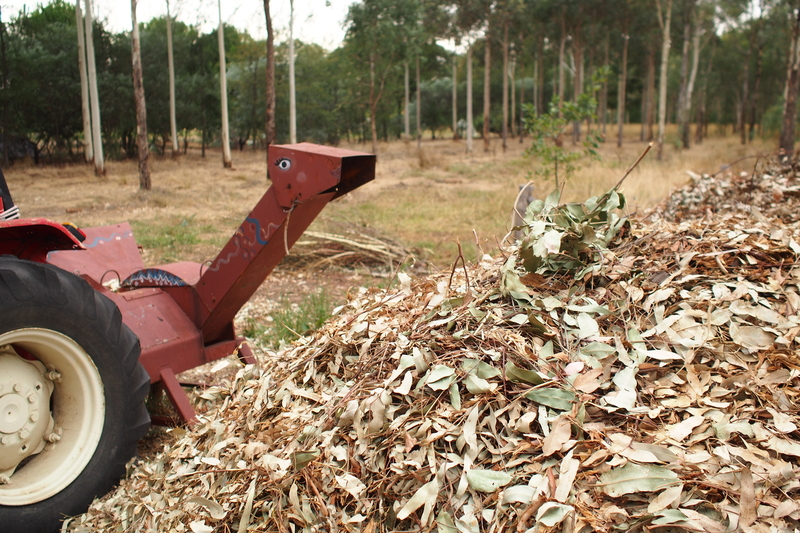 Feb 2015 ‘Chewy’ the tractor powered chipper feeds orchard and forestry branches onto the wood chip compost pile, where it composts for about two years. 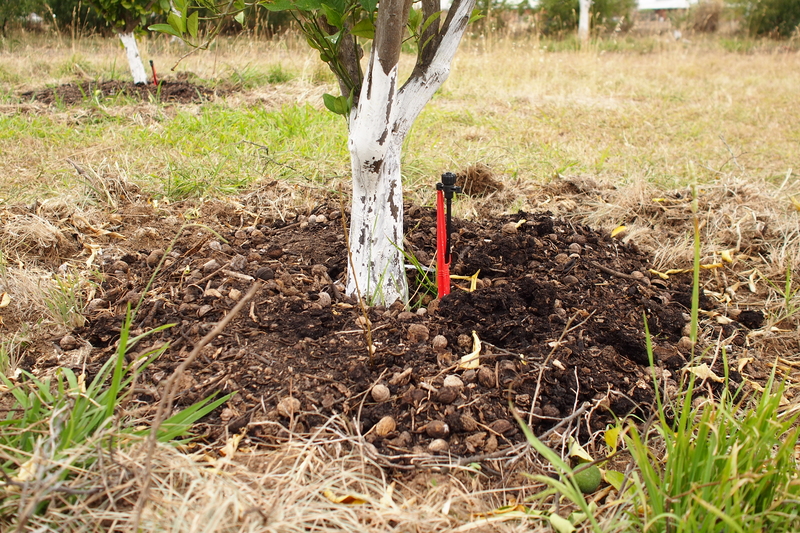 Feb 2015 Wood chip compost freshly placed under an orange tree (with whitewashed trunk to protect from sunburn). The main pest problems (apart from birds!) have been codling moth in apples, pears and quinces, fruit fly in stone fruit, and black olive scale on olive trees. Feb 2015 Chickens on free range help clean up fallen fruit, but would need to be at a very high density, possibly to the point of damaging tree roots, to have any chance of preventing pest larvae surviving in the soil. Here, they help, but are not the whole solution. Nets are to keep birds from fruit. To manage Codling Moth we try to remove all infected fruit and ferment it in buckets of water to kill eggs and larvae. Mating disruptor pheromone sticks are placed around the orchard from Spring to greatly reduce the overall population of Codling Moth. Fruit Fly have been endemic in North Central and North East Victoria since at least this newspaper article in 1907. To manage Fruit Fly we try to remove all infected fruit and ferment it in buckets of water to kill eggs and larvae. Every two weeks we renew the bait in fruit fly traps to reduce the population. 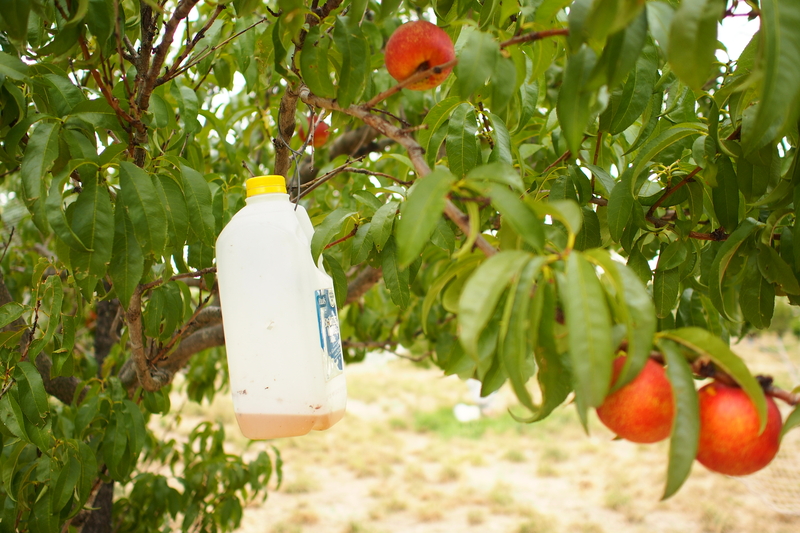 Stone fruit are now harvested as soon ripe enough to ripen fully off the tree, checked carefully for signs of damage or infestation, and refrigerated for at least 11 days before going to market, to ensure any fruit fly eggs or other life stages are destroyed. Fruit fly trap made from a salvaged and re-used milk carton, with bait replaced every two weeks. 1 teaspoon natural vanilla, 1 tablespoon cloudy ammonia, 1 cup water, 10 mm holes drilled into container high above the bait. 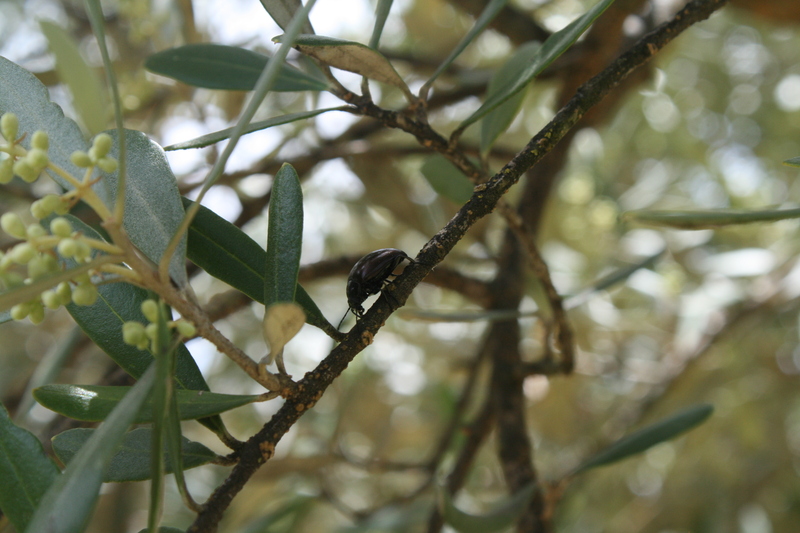 Black Olive Scale, if numbers get high, requires spraying with non-toxic white oil in about October when the tiny scale insects are outside of their protective shelters and can be suffocated by the white oil. Oct 2014 These bronze coloured beetles appeared (to my hopeful eyes) to be feeding on black olive scale, but the detail was too small for me to see. Few trees had many scale insects in Spring 2014, and we didn’t spray white oil that year.